"The Global Hawk is a tremendous asset in the war on terror, equipping American military commanders with virtually real time surveillance that helps bring concealed terrorist plots and enemy positions to light," said U.S. Rep. Wally Herger of California's 2nd congressional district. "The men and women of the 9th Reconnaissance Wing at Beale Air Force Base, located in the Northern California district I represent, are operating Global Hawk in combat today in ways never imagined. The new Block 20 Global Hawk will strengthen their ability to quickly and accurately find and destroy terrorist targets wherever they may be." 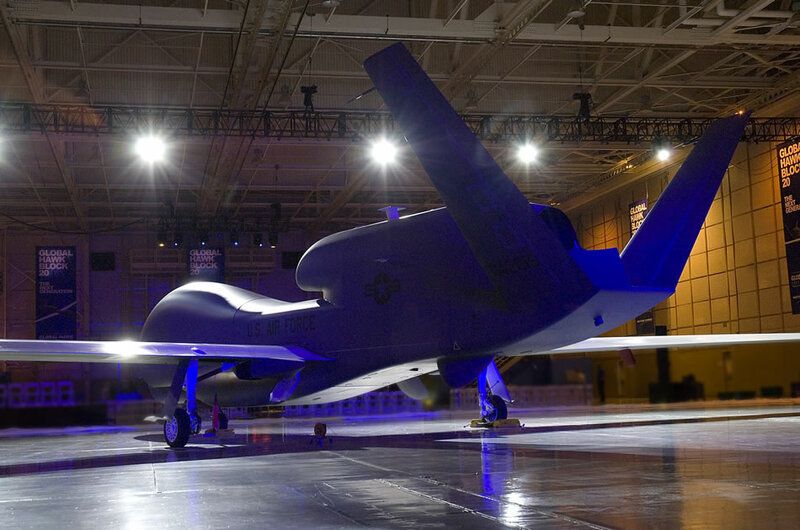 The Block 20 Global Hawk represents a significant increase in capability over the Block 10 configuration. The larger Block 20 aircraft will carry up to 3,000 pounds of internal payload and will operate with two-and-a-half times the power of its predecessor. Its open system architecture, a so-called "plug-and-play" environment, will accommodate new sensors and communication systems as they are developed to help military customers quickly evaluate and adopt new technologies. "Our Global Hawk customers, employees and industry teammates are committed to continuously deploy increased combat capability to the fight," said Scott Seymour, Northrop Grumman corporate vice president and president of the Integrated Systems sector. "Production Global Hawks are serving in combat with distinction today, and the addition of the Block 20 to the fleet will build upon this success and pave the way for the ever increasing capabilities currently in work for future block deliveries." Following a final series of systems tests and a flight test program at Edwards Air Force Base, Calif., the new Block 20 air vehicle will be delivered to the Air Force's 9th Reconnaissance Wing at Beale Air Force Base near Sacramento, Calif. Although Global Hawk is still in concurrent engineering and manufacturing development and low-rate initial production, the system has been deployed to the operational theater three times since 2001 and has logged more than 6,500 flight hours during combat missions. Two production Block 10 aircraft are operated by the Air Force in theater today. The first Block 20 is the 17th Global Hawk air vehicle to be built. Northrop Grumman produced the first seven air vehicles under the advanced concept technology demonstration phase of the program. Nine Block 10 aircraft have been produced, including the two aircraft supporting the war on terrorism and two U.S. Navy aircraft operated under the Global Hawk Maritime Demonstration program. "The entire Global Hawk program team has done an exceptional job executing the Block 20 program while supporting the needs of our combat forces, and assisting other military services and civil agencies in their evaluation of Global Hawk for maritime surveillance, drug interdiction and homeland security missions," said Randy Brown, director of the Air Force's 303rd Aeronautical Systems Group, Wright Patterson Air Force Base, Ohio. The Global Hawk Maritime Demonstration program is helping Navy evaluators develop maritime surveillance requirements for future systems. Global Hawk has successfully participated in two naval exercises to date, Trident Warrior in November 2005 and the international Rim of the Pacific exercise in July in the Pacific Ocean around Hawaii. Earlier this spring, Global Hawk completed a congressionally directed demonstration of its ability to conduct drug interdiction surveillance. The system flew four flights off the Florida coast and above the Caribbean, locating and identifying low-flying aircraft and sea-going vessels. Operating autonomously from takeoff to landing, Global Hawk flies at altitudes up to 65,000 feet for more than 36 hours with a range of 13,500 nautical miles. Using its synthetic aperture radar and electro-optical and infrared sensors, the RQ-4 Global Hawk provides high-quality reconnaissance imagery even in adverse weather conditions, as demonstrated during sandstorms in Iraq. Its high altitude and long endurance allow it to conduct surveillance over an area equal to the size of Illinois in just 24 hours. Northrop Grumman's Global Hawk program is based at Northrop Grumman Integrated Systems' Unmanned Systems Development Center in San Diego, Calif. The company performs Global Hawk sub-assembly work at its Unmanned Systems Center, Moss Point, Miss., and final assembly at its Antelope Valley Manufacturing Center in Palmdale.